We’ve lived in our little house for twenty-five years. For a quarter century I’ve tried to nourish the land we are living in, to plant native plants and to offer increasing cover for insects, birds, and small creatures. This piece of land is as holy as any other on this earth; it deserves my care. The people who drive by our house are generally headed for Overbrook Estates, a wealthy residential neighborhood that abuts our modest little circle of ranch houses. There’s been no other way to get to Overbrook most of the time we’ve lived here. The construction of another wealthy neighborhood added another side street but traffic past our own house remains minimal and mostly local. People drive past our home to get to theirs. Aside from our short strip of straight road which leads to the entryway to Overbrook Estates, all the other roads are windy, curvy, and hilly. For twenty-five years folks have driven the short straightaway that is our street and dropped plastic bottles, cans, candy wrappers, cigarette butts and more on our lawn. But that was not the cause for the frustration I brought home this morning. I like to walk. Last Monday I decided to walk around Overbrook Estates. I don’t usually walk there because it the road is so windy and hilly; cars won’t see me until they are practically at my feet or my back. There are no sidewalks. But I had less time for the walk than usual; walking there would take me a little more than half an hour. So I chose that route. Overbrook Estates features homes that are worth up to ten times the value of our little ranch house. Because homes are placed in large plots of land, they are often set back and high above the street – far away from the little creek that runs on one side of the road. The yards are landscaped and the lawns are neat. That morning, I passed by both lawn service and maid service cars and vans. As I walked through the neighborhood, I saw multiple signs. 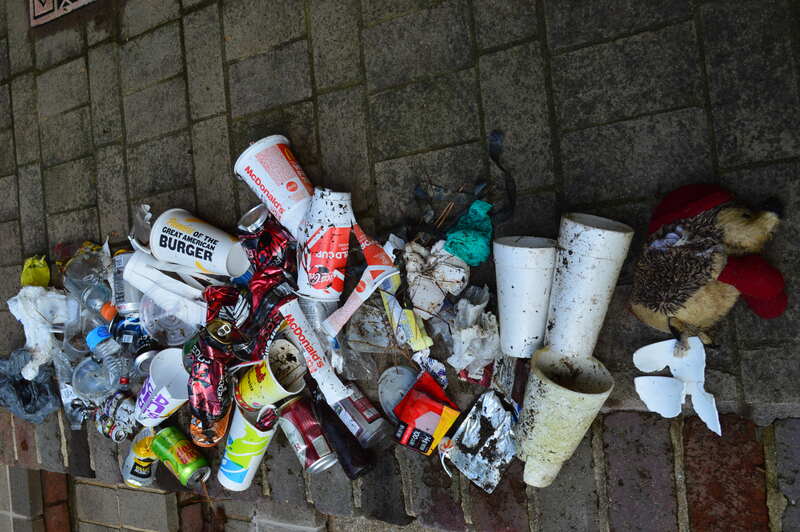 One had to do with saving our local school, another asked dog owners to clean up after their pets. There was a sign that read “Thank you, Jesus!” and another that asked people to drive with children in mind. What’s to see in Overbrook Estates? Immaculate homes, well-manicured lawns, full-grown trees, and signs about good behavior and offering gracious thanks. And garbage. Cans and bottles and plastic bags. When my hands were full, I put two plastic bottles on the driveway they lay next to. That, I thought, would ensure that at least they would be recycled. Yesterday, I walked the same way – this time, armed with plastic bags and gloves. 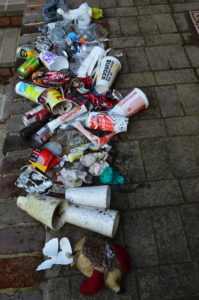 I picked up cans, glass bottles, plastic bottles and straws. I found cups from McDonalds, Bojangles and Starbucks. I gathered plastic bags, candy wrappers, old Christmas decorations and even a stuffed animal that was sodden and ripped apart. After thirty minutes, my two bags were filled. People went in and out of their driveways and passed me by. Though residents drove past me and my plastic bags, though some saw me picking up in their neighborhood, none stopped to thank me. Even the driveway where I’d left plastic bottles two days earlier had – you guessed it – the same two bottles lying where I’d put them. I walked around one of the wealthiest neighborhoods in my town. What I gathered during that time was a fraction of the trash I saw; some had fallen into the creek and was simply unreachable given that I was in tennis shoes. Eighty to ninety percent of what I gathered was recyclable. I know, because I spread it all out when I got home, sorted it, and recycled everything I could. It’s been pretty annoying to clean up after those who have tossed their garbage onto my lawn for the past twenty-five years. I like to think of my little plot as a holy space. But it felt a lot worse to walk around a neighborhood where people pay for maid services to clean their homes and lawn services to trim their bushes but appear to care less about the earth they built upon than the grand homes they inhabit. We’re filling our oceans with garbage, we’re eradicating species, we’re paying little attention to the way our earth cries out to us for relief from our selfish, self-centered behaviors. It’s the time of year when Jews read through the Book of Deuteronomy. And in this book we are reminded not to destroy trees, to be certain to give from the land to the poor and vulnerable, and to offer the land itself a sabbath rest from human desires and needs. Dear neighbors everywhere: All the earth is holy, including that which supports your homes. Please treat it as such.